A weekly newspaper court reporter successfully challenged a bid to keep secret the identities of a mother and father convicted of neglected their baby. Keith Hunt, who works for the KM Group, opposed a prosecution bid to keep the child concerned anonymous, which would also have meant the publisher was unable to name the defendants. Jodie Hicks and Reece Adams, both 20, admitted ill-treatment or neglect of a child at Maidstone Crown Court after failing to get medical help for their baby for several hours after he became seriously ill. But the Crown Prosecution Service applied for an order under Section 45 of the Youth Justice and Criminal Evidence Act 1999 banning identification of the nine-week-old baby. This was challenged by Keith, who said the child should be identified in order to permit open justice, which would otherwise be impossible. He also argued a child of such a tender age would not be affected by publicity, or that such publicity could be detrimental to his long-term wellbeing. 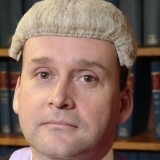 During two days of hearings at Canterbury Crown Court, where the sentencing Judge Julian Smith was then sitting, the application was opposed by lawyers for the Crown Prosecution Service and the couple. The child’s grandmother also objected in a letter. But after considering lengthy arguments, including further submissions by Paul Hooper, the KM Group’s journalist at Canterbury Crown Court, Judge Smith, pictured above left, refused to make the order. He did so on the basis the child would not be named and that any report of the case on the KM’s website Kent Online would be removed after three years. Maidstone Crown Court had heard the baby had to be “actively resuscitated” and tube fed for five days after the pair failed to seek medical attention for seven hours. The child has since made a full recovery. Adams was sentenced to 10 months youth custody and Hicks to eight months suspended for 18 months with 80 hours unpaid work. That’s the way to do it – well done, Keith. Not sure how sentencing her to 80 hours unpaid work will help her not to neglect her child. Unless the child is now in care? If not she needs 80 hours of supervised parenting guidance!